Ladies, do you love to sing? Have you given up singing but would love to experience that joy again? 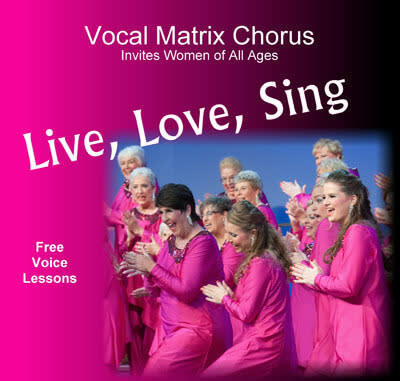 Vocal Matrix Chorus is a dynamic, award winning Sweet Adeline International Chorus dedicated to musical excellence and sharing the joy of a cappella four-part harmony. They are committed to performance education and creating high energy performances. Women who love to sing and who would like to learn about singing unaccompanied four-part harmony, performance, choreography, and showmanship skills are invited to join Vocal Matrix every Monday evening.